Projection TV was one of the most interesting technologies in the 1980s and at that particular time it was definitely top of the line. The idea is that it used a technology which included rear and front projection systems. These were the first big screen televisions and even if they had a few convergence problems, there’s no denying that these brought in front some extraordinary results and a very good experience for their user base. This is one of the major projector television models out there and it has managed to impress with its unique visuals, very good quality and attention to detail. It’s one of the models that had an interesting design and a curved appeal, but at the same time the image quality was very professional and crisp, maybe one of the most interesting projector televisions at that time. It was quite large, around 50” and it allowed people to enjoy the beauty of having a large screen in their living room. 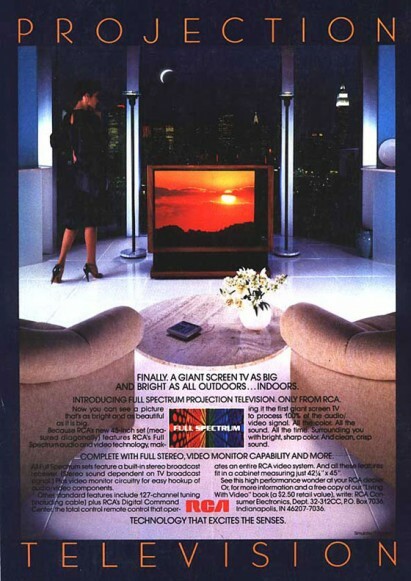 Zenith also created a large screen TV in the early 80s and it was created specifically for the customers that wanted to have a wooden console TV in their family or living room. 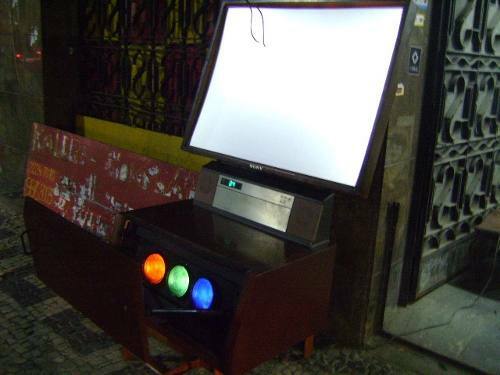 It was most probably the best model at the time and it came with a new way of enjoying TV, one that did not use a huge white blank screen. The projection system was one of a kind and the fact that it was integrated into a wood console made it even more interesting and appealing, that’s for sure. You have the On button on the remote control and when you didn’t want to use the product any more you just have to switch if Off. The screen would then descent into the wooden cabinet, something that was amazing at that particular time. RCA also delivered a three-tube projection set that was designed to have a much smaller footprint when compared to the larger units, all while still delivering a great screen with a console looking cabinet. Their focus, pretty much like in the case of Zenith was on the wooden cabinet and appeal rather than the size of the screen, something that made the entire console more appealing. All these models were at their prime in the 1980s and they have managed to revolutionize the way we think about TVs as a whole. These were the first models that pioneered those large screens which are now a reality. Their stylish look, combined with one of a kind features clearly show the uniqueness of the entire experience, so you shouldn’t hesitate to give them a try if you can, these are definitely some of the best choices if you want an older TV station. Their design and technology still amazes people from all over the world, something that makes them a highly sought after collector item!